Most of us can’t conceptualize life before digital. In the old days, people looking for a hotel would drive down the road. If the hotel was all booked up, they would drive on down the road to the next hotel. Enter Hilton, a 96-year-old brand that has innovated at every turn. In the 1950s Hilton wanted to make it easier for customers to book rooms and created the world’s first central reservations office where customers could book over the phone, telegram or teletype. The office consisted of a team of eight “agents” who would write on a chalkboard to book reservations. How times have changed! 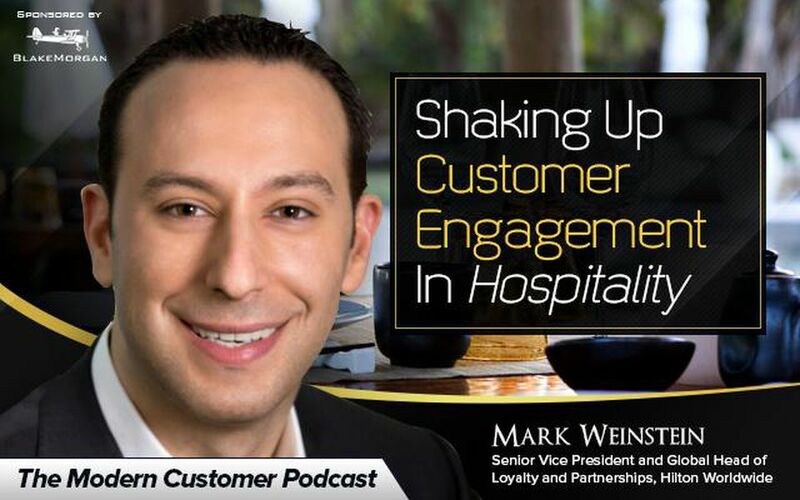 In this week’s modern customer podcast we talk with Mark Weinstein, Senior Vice President and Global Head of Loyalty and Partnerships for Hilton Worldwide. There is much change to the travel industry, and Hilton has had to stay on its toes. The demographics of their travel has shifted with people traveling at younger ages due to increased accessibility—it’s simply much easier to get around than it used to be (see above paragraph around how one would find a hotel in the old days). There are market shifts such as the sharing economy that has altered the hotel industry. Hilton has created numerous programs in conjunction with the sharing economy including a partnership with Uber. It might make your head spin to think about Hilton’s scale, with 13 brands, spanning more than 4,500 hotels across over 100 countries and territories. That said, they are a fantastic case study in thinking about how today’s biggest companies are tackling the complex modern digital landscape.